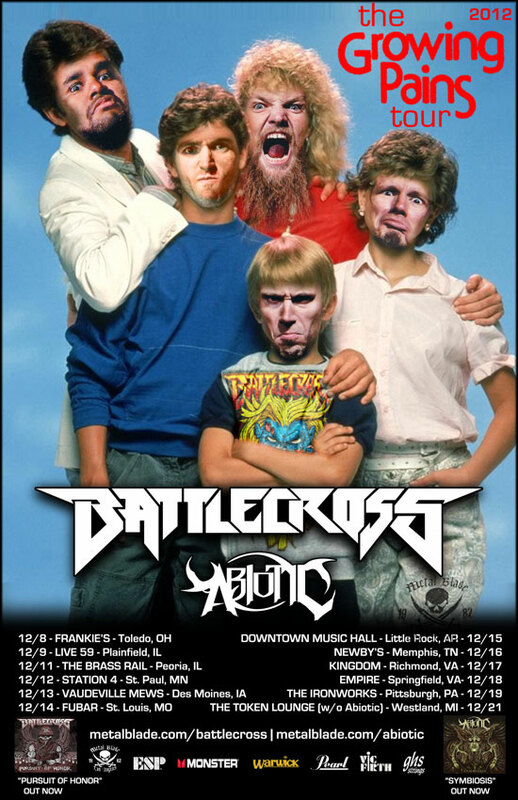 Detroit, MI’s BATTLECROSS have announced that they will embark on a short, headlining tour with label mates ABIOTIC this December. Two of this year’s breakout Metal Blade bands will embark on The Growing Pains Tour, stopping at various cities throughout the Midwest/southern US, including Des Moines, IA, Richmond, VA, Peoria, IL, and more. The tour runs from December 8th through December 21th and will be one of your last chances to catch a metal show before everyone heads home for the holidays! The confirmed dates are listed below. BATTLECROSS recently celebrated 52 straight weeks with the debut of ‘Man of Stone’ at #5 on the SiriusXM Liquid Metal Charts, following ‘Breaking You,’ and their first single ‘Push Pull Destroy’, which spent five weeks at #1. The channel also debuted the band’s studio version of Pantera’s Hostile that thrashed audiences on this summer’s Trespass America Festival. The single for ‘Hostile’ is now available on iTunes and the track can be preview and purchased HERE. The band’s debut album, Pursuit of Honor, is available now. Listen and order at www.metalblade.com/battlecross. South Florida’s five-piece death metal outfit ABIOTIC will provide support for the tour and have recently released their debut full-length, Symbiosis, on October 22nd. Listen to “To Burgeon And Languish”, watch the video for “Vermosapien”, as well as a video bass less over at www.metalblade.com/abiotic.